Summer’s End …New Beginnings for the School Year. Sr. Altagrace with children from St. Helene. 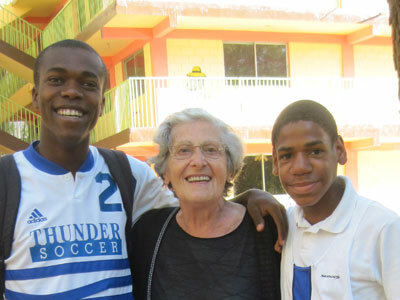 August and September have been two long months, with many goodbyes to a fantastic team of summer volunteers and to Sr. Altagrace Mathias, NPH Haiti Home Director. They shared their love with all of our children in many forms, a hug, teaching them English, taking them for walks in the countryside, assisting with swimming and horseback riding, teaching them to read, to bead and to bake. The skills which were shared were endless, as the love and the fond memories the children will cherish for life. Long-term volunteer, Caterina from Italy. Jean and Caterina have been volunteering with NPH Haiti since 1999, and they are both an inspiration to all of us, of all ages. It is hard to believe that you both still have so much energy…you put us young ones to shame! There you were helping to bail out the water during Hurricane Isaac and busy cooking for volunteers and guest volunteers from Honduras as well! Only in the past fortnight have we seen the regular EDH electricity reach us up in the mountain. It is yet to return to a ‘normal’ service. The rainy season has brought several huge thunderstorms per week, blowing out inverters, internet and mobile phone services. When the lightening strikes here, it shakes the buildings and you jump! A perfect location for recording movie sound effects. Aisling Ríannon, summer volunteer with Marie. The Ti Boutik (Little Shop) was a very successful summer project with a group of 20 children. They learned to bake and make products to sell each week in their little shop. A big thank to David and Sue Raethorne for sponsoring the project and to University of Limerick student Kate O’Néill. As a reward, they were taken for a day out in Petionville to buy a present and to have hamburgers and fries. For many, it was their first time! 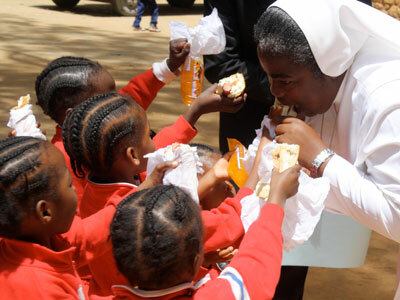 Forty-six children volunteered to attend school summer, which was a great success and is a continuing benefit to them now that they have returned to regular school. During the week of the August 19th we were very fortunate to have Joyce Hin and Michelle Tella assess our children with speech therapy needs and to train our special needs staff. Michelle and Joyce are graduates of Colombia Unversity Masters in Speech Therapy. We have had visitors from far and wide, donors from Spain, ‘Mr Brown’ and Philip O’Gara from Westmeath and Italy were recording a song with the children to be released in Italy, and visiting volunteer therapists from our sister home in the Dominican Republic. 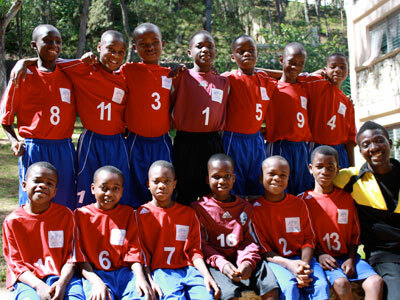 Our 14 boy soccer team travelled to Poland to represent Haiti in the Danone World Cup! And they did us proud! Professeur Veronique Sufal is our special needs teacher with our 1st and 2nd grade students and students requiring speech therapy. October 1st saw the official opening of the school year in Haiti but our children had begun school two weeks earlier! Staff had begun training and preparations four weeks earlier, no rest on the mountain. We have begun a new ‘school’, L’École Junior des Artes et des Métiers, a school/program which caters to the needs of the children who experience learning, emotional and behavior difficulties. In Haiti, the educational system is very old fashion with writing on the board with chalk and lecturing. Ms. Jennie Wynn with students. Our 51 children are learning basic mathematics, reading and writing skills necessary for life in Haiti. 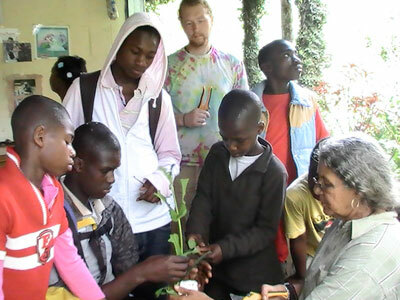 Also, they attend gardening and ecological craft training with Ms. Jennie Wynn, a Haitian ecologist. They are partaking in a recycling project to clean up the environment and simultaneously raise funds to pay for materials for their school materials and projects. The children are learning to cook, garden, knit, crochet, make jewelery, dance, play music, basic hygiene, basic computer literacy, attending group art therapy sessions with Gerry Lee. Many children have begun work experience (stage) to help them to choose which skills they would prefer to focus on for their future. 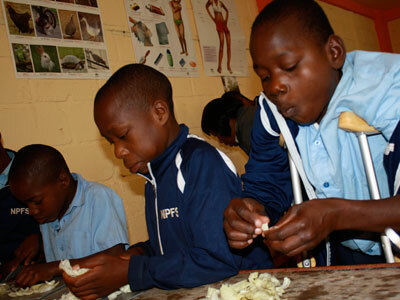 Children learning how to prepare food and cook. Professeur Jennie Charles is in the photo with Erlanda Elie. Jennie is Erlanda’s favourite teacher! 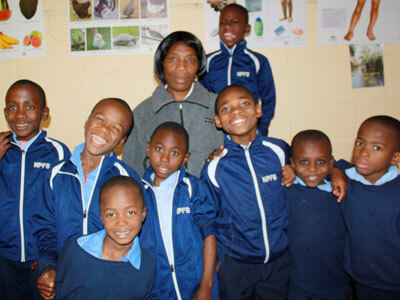 The project has been receiving great support from the orphanage’s staff and management. Sr. Monet (School Director), social workers, house supervisors, Gena Heragty (Special Needs Director), psychologist and the general house staff. 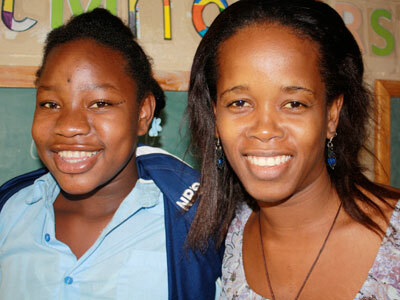 At present we have three Haitian teachers who are highly motivated, energetic and are like parents to our children. They are Professeur Jennie Charles, Professeur Veronique Sufal, and Professeur Duvenson. As each week goes by, the team gains new members, all aiming to give these children a viable future in Haiti. Last Monday, Dr. Ernesto took up his post as Doctor to our home! Bienvenue Dr. Ernesto! On Friday, we got to taste the water from our new Ultra-violet filtration system, coordinated by Karun Koenig (Waterisright.org) and our German fundraising staff. It was an international team effort which brought this project to fruition. Jan Weber, Sonja Smolka, Cassangnol (NPH Germany) Karun, Vern Conaway and Janvier Verne (NPH DR) and Faustin and his maintenance team here at the St. Helene home. The children and staff now have access to clean and safe drinking water! Mesi anpil! 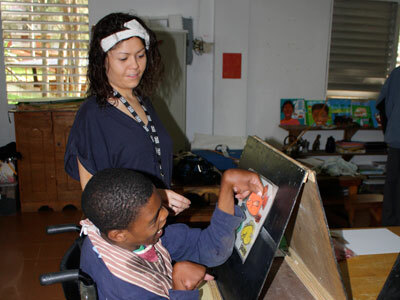 Chloe Gleeson, summer volunteer, assisting in our clinic and with the special needs children in Kay Christine. Contributed by: Jacinta McGuane, volunteer from Ireland. Oh my God! Caterina is like a film-star! She certainly has the gift of youth. She looks fantastic.